Is aged manure the same as composted manure? Horse manure can be composted, but not on its own. A little effort and monitoring is needed – even if the manure has already been sitting for a long time. Many people refer to their old pile of manure as “aged” which does not always mean composted. Using raw or improperly-composted manure as a fertilizer will not only be smelly, but can also harm the health of your pastures and gardens. If you have manure that has been sitting untended for a while, then here is what you can do to make sure it becomes an odour-free and nutrient-rich fertilizer. When composting anything from food scraps to animal waste, monitoring the changes in temperature is critical. Horse manure has to reach a temperature of at least 55 degrees Celsius. This will eliminate all the bacteria and unwanted plants or pests. If the temperature is not rising, then the manure is not composting. Carbon- or nitrogen-rich components will need to be added to create an ideal balance of the two, or else you may need to turn the pile (by hand or mechanically). The key to composting manure is proper air flow- this is the reason why a pile of manure cannot compost by itself, as not all parts of a pile are exposed to the air. If you cannot turn it by hand, then you can spread out the pile and insert PVC pipes for self-aeration. Once the temperature rises it will eventually begin to fall and return to air temperature. At this point, your manure should be fully composted. 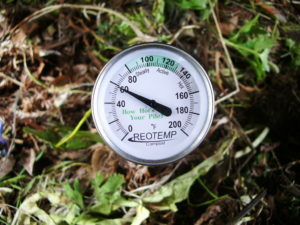 To produce quality compost the use of a thermometer is recommended to monitor these important changes. Within three weeks or more you can turn your aging pile of horse manure into a natural resource! A composting thermometer indicating the temperature of a pile of manure. A representative from Langley Environmental Partners Society will be attending the 2017 Mane Event in Chilliwack October 20th-22nd! We will be joining our friends from the Horse Council of BC in their booth to provide advice and education to horse owners on proper manure management. Come visit us to find out how you can save money on your manure management practices and improve your ecological footprint! 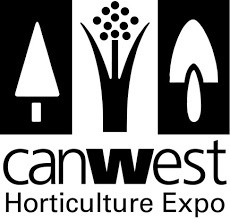 A manure expert from LEPS will be attending the 2017 CanWest Horticulture Expo September 27th & 28th at the Tradex in Abbotsford! Come visit our booth to learn about the benefits of using composted manure in gardens and on lawns, how it can reduce your environmental impact when compared to synthetic fertilizers, and how you can obtain it for free! LEPS will be attending the 2017 LMQHA Horseman’s Bazaar and Country Fair on March 12th at Thunderbird Show Park! The event is put on by the Lower Mainland Quarter Horse Association and will have live entertainment, a free BBQ, demonstrations, contests and more! Come find our booth to talk with our Manure Link representative, obtain advice on composting your horses manure and learn about the Manure Link program! Many may not know that Canada is the World’s leader in flax production and exportation. So far for 2016/2017, Canada has 189,000 tons of licensed flax exports. Within Canada, the flax industry focuses on the consumption of flax seeds and the production of linseed oil. The majority of the flax crop, mainly the stem, is a fibrous material that is underutilized in North America. If not shipped off to China or Europe to be used, the straw is most often burned, contributing to atmospheric pollution. 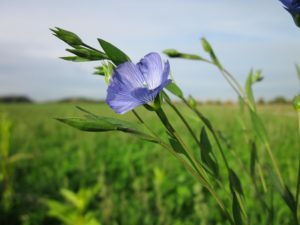 In Europe, flax is specifically grown for its fiber which is used to make linen, paper, and a variety of other products including animal bedding. As a bedding, flax straw in gaining popularity in North America as horse and livestock owners are beginning to recognize its benefits. When compared to wood chips, flax is greater than 50% more absorbent. This means reduced smell, reduced costs, and reduced labour! Flax bedding is healthier for animals as it is dust-free, and its lower carbon to nitrogen ratio makes its compost easier and quicker than wood chips. Contact your local feed store to obtain flax bedding today and help to put a readily available resource to use! This last stretch of Winter has surprised us all with the amount of snow it has sprung upon us! Even with all the extra work associated with snow, we must make sure that it does not negatively affect our manure compost so that it is ready to go for the Spring, which, believe it or not, is just around the corner! 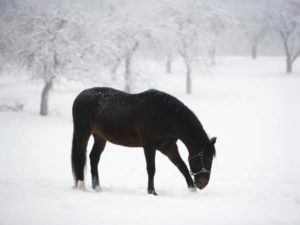 Make sure to keep your manure pile covered from the snow to keep it from cooling down too much. Find information on composting over the winter on the site. Welcome to the new Manure Link site! We hope you find this website useful and that it inspires you to better your manure management practices for yourself and for the environment. On this site you will fine an interactive calculator to help determine storage requirements, a list of our Manure Mavens organized by region, information on noxious weeds, and more!